The second casting to which attention is called, is the brass bearing represented in Fig. 150, which is to be finished all over. On examining the drawing, first with regard to removing the pattern from the sand, we find that it must be molded on its side, and, that the molder may not lose the time required in cutting away the sand, as in Figs. 112 and 113, Pattern Making, Part I, the pattern must be parted or made in two halves. For finish on this small pattern 1/16 inch will be sufficient, and draft will be required only on the ends of the pattern and on the ends of the core prints, which, in this case, should be not less than 1 inch long. This is necessary because the core-print molds must sustain the weight of the dry-sand core. The pattern for this casting is represented by Fig. 151, in which it is seen that, unlike Fig. 138, the body and core prints are perfectly straight, a slight draft - 3/16 inch in 12 inches - being given to the ends only of the pattern and to those of the core prints. A slight curve of 1/16-inch radius should also be made at the intersection of the body of the pattern and the inside of the flange at aa. The wood in being prepared for this pattern should be cut 2§ inches longer than the finished pattern. The dimensions of the two halves would each be 1 3/4 by 3 3/4 by 8 3/4 inches. Having fitted the two insides accurately together, and dressed one edge of each straight and at right angles to its face side, with the marking gage draw a center line on each, not only on the face but also across each of the two ends, Fig. 152. Place about 1/2 inch of the pointed end of a l 1/2-inch wire nail on the center line, as shown in Fig. 152, and, striking it with a hammer, make an indentation at each end of both pieces of stock to form the location of the headstock and tailstock lathe centers. Glue 3/8 inch of the joint at each end, and clamp the stock together, being careful to keep the ends and the edges of the stock flush with each other. At the ends insert two metal corrugated fasteners, as shown in Fig. 153, placing them near the center of the end, but not so as to come in contact with the lathe centers. Drive a nail into the center hole in each end to force out the glue, for, if the glue should harden, it would be impossible to center the stock in the lathe. Fig. 150. Finished Bronse Bearing Flanged at Both Ends. Fig. 151. Pattern for Bushing, Fig. 160. The dowel-pin holes should be drilled before the stock is turned to a cylinder so as to have them stand perpendicular to the joint. The location of the dowel pins should indicate which way the parts go together. 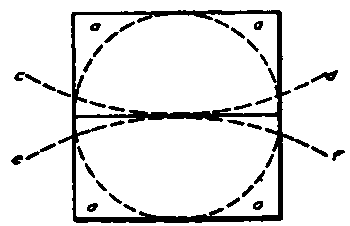 If it is attempted to so locate the dowel pins that the parts can be assembled either way, it is very likely that they will not assemble accurately both ways - and when the nowel part of the pattern is in the mold it is not so easy to tell which way is correct - so, unless the core prints arc quite small, locate one dowel pin in the core print and the other in the body of the pattern, as shown in Fig. 154. They could also be located to one side of the center line, if it is not desirable to put them in the core print. The dowel pins should be placed as far apart as possible to prevent side slip of the pattern when the dowel pins and holes have become worn. Mark on one side of the stock the form of the pattern to show the location, and drill 1/4-inch holes through the up]>er half of the stock and to a depth of about 1/2 inch into the lower half. The (Jewel pins need not be inserted until after turning. Glue a pin in the holes drilled just deep enough to have the surface of the pattern turn smoothly. These pins should be made of the same stock as that used for the pattern. The dowel pins should always be inserted in the hole having a bottom, so that the pin cannot be driven below the proper height, and should always be placed in the cope part of the pattern, as in Fig. 151. Fig. 152. Preparing Stock fur Split Lathe Wort. When centering the stock in the lathe, great care must be taken that the spur on the centers enters the small hole left in the ends of the stock exactly on the parting line of the pattern. Fig. 154 shows the pattern as ready to be taken from the lathe. Saw off the waste stock, trim the ends true with a chisel, and sandpaper smooth. Shape the hardwood dowels to the proper form, Fig. 155, and, after gluing them in place, clean off any excess glue. These dowel pins will always bring the parts into accurate alignment when used by the molder in the foundry. Before removing the turned pattern from the lathe, it should be smoothed and finished with sandpaper, but care must be taken not to allow the sandpaper to come in contact with the sharp corners and angles of the pattern, or they will be rounded off and the work ruined. For pine, only the finest paper - No. 1/2 and No. 0 - should be used on lathe work, and the paper must not be held in one position on the revolving work but must be kept moving laterally, that is, from side to side, to avoid cutting depressions in the surface. When the scraping tools are kept sharp so that they cut freely and without pressure, a light touch of sandpaper only is required. Fig. 155. Diagram Showing Proper Proportions of a Dowel Pin. In the construction of this pattern, it may be made of two blocks of 1 3/4-inch stock as described, but the tendency of the two halves will be to become rounding on the parting line, as shown by the dotted lines cd and ef, Fig. 156. This is caused by the removal of considerable wood in the process of turning, at the angles aaaa, thus exposing fresh surfaces which are farther removed from the original surfaces of the plank than the surfaces on the line of parting. The exposure of these deep inside fibers of the wood will cause a shrinkage of the pores and draw the pattern more or less, according to the position of the annular growths, and also to the more or less thorough sea-soning of the wood, in the direction indicated. Fig. 156. Diagram Showing Tendency of Pattern Stock to warp. Fig. 157. Method of Gluing Stock to Prevent Trouble Shown in Fig. 156. Fig. 158. Core Box for Pattern, Fig. 151. If the pattern is intended for temporary use only, it may be constructed as above; but if durability and permanence of shape are required, the two blocks should each be glued up out of thinner stock, with the annular growths carefully reversed, as shown in Fig. 157. This is done not only because thin plank is more evenly and better seasoned, but because in gluing, the tendency of the pieces to warp or spring is counteracted each by the other, and, in addition, the gluing of several thin pieces together stiffens and makes the resulting piece much firmer and stronger than a large block or piece of the same size obtained without gluing. The core for this pattern being straight from end to end, and cylindrical, only a half-core box is required, as shown in Fig. 158. After being laid off and worked out in the same manner as described for the core box, Figs. 140 and 141, cut the ends of a with draft of 1/4 inch in 12 inches, and glue and nail on the ends c and e, which may be 3/8 inch to 1/2 inch in thickness. Shellac and finish as described for the pattern in Fig. 138, giving first two coats of orange or white shellac, and for the last coat on the core prints of the pattern and the inside a of the core box use the red, the body of the pattern being left natural color - with three coats - and the outside of the core box either natural or black.